APAAME - Finding the past frame by frame: Flight 20141015 - The Longest Day? 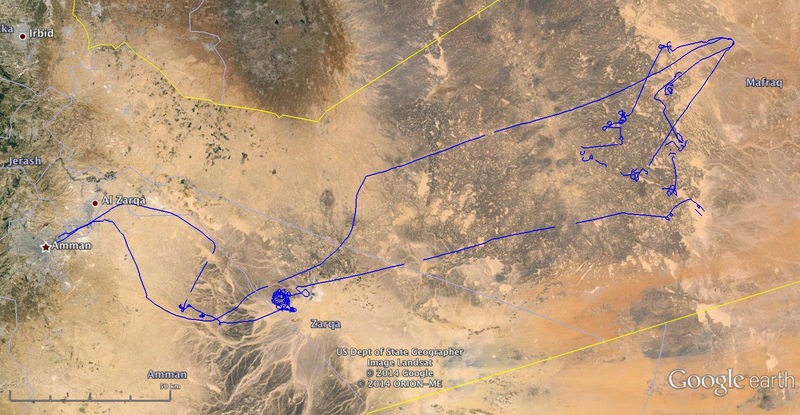 Flight track log from 20141015 - the survey of the basalt near Uweinid we conducted is particularly prominent. A day’s flying always starts with the rigmarole of having to get through the security gate at Marka airbase. This year we were waved through on the first day as I was being asked if I wanted ‘Eight Squadron” and I said yes; not really knowing the exact details of what had just happened (as my Arabic is non-existent). The second day I blew it but today, having learnt what the question would be, and having memorized the Arabic for 8 Squadron, we sailed through. 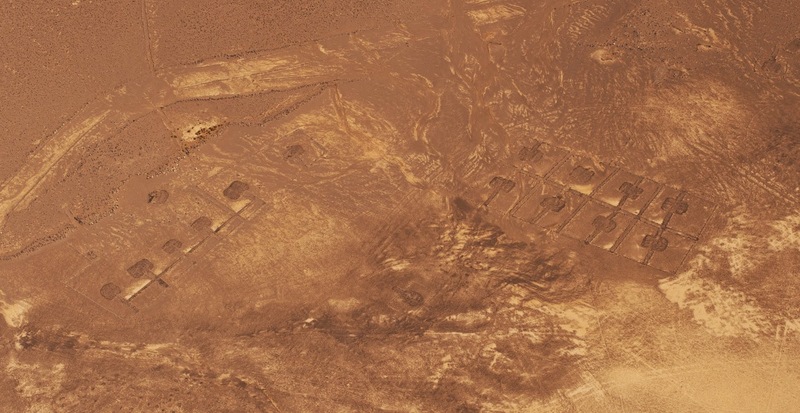 It has taken 16 years for this refined level of communication to be achieved – just as it has taken all these years to train a generation of young Huey pilots to understand what on earth these crazy archaeologists are doing orbiting sites hour after hour. Our pilots are now even taking their own pictures as they are becoming interested in what we see. All our orbits are to the right (as we sit on the right) but today was a “first” in that the pilot did a orbit to the left, especially for the co-pilot (seated on the left) to see what we had been looking at. So, what did we see? With over 2,000 images taken by the three of us (Bob, Becc and Mat) in 7.5 hours (see flight trace of today’s excursions) the highlights are particularly difficult to select. 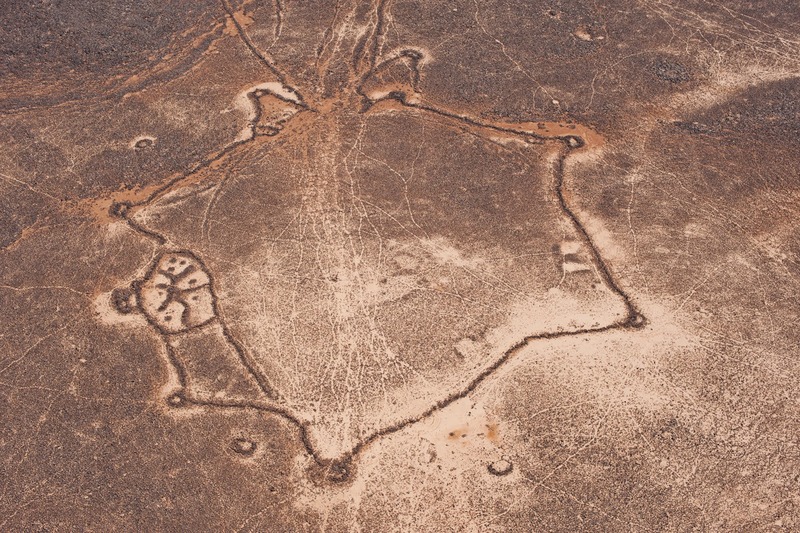 Our aim was to survey parts of the black basalt desert in the eastern part of Jordan, starting at Azraq and heading as far east as Ruweishid. Predominantly our targets in this region are prehistoric sites, but Qasr Uweinid always stands out as such a wonderfully situated Roman fort, on a promontory. A Pendant with a close shave. © APAAME_20141015_RHB-0123. Mainly we are photographing “Pendant”, “Kite” and “Wheel” sites – all named according to their shape; their date and function are less well known. 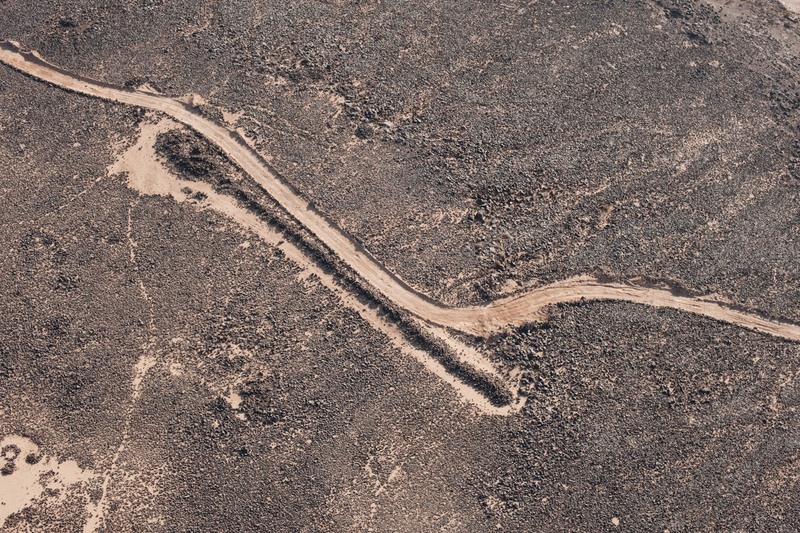 The most striking Pendant (almost certainly a burial site) was this one – so nearly completely obliterated by a competing road bulldozed through since we last photographed. A kite with wheel enclosure built over it. © APAAME_20141015_RHB-0463. There were many Kites but the light this time of year highlights them so well – and rare to have both a Wheel and a Kite so entwined. YAMOUK written in basalt across a mud pan landing ground. © APAAME_20141015_RHB-0303. However it was the twentieth century remains which really took our breath away. In preparing for the flight Becc had marked two former RAF installations, visible on Google Earth but we had no idea what would survive. They are remnants from the time when Jordan was under a British mandate (then known as Transjordan), and the creation of the Cairo to Baghdad Airmail Routes. The first to be photographed was a landing ground with name "YARMOUK" created in stone, inlaid in the sand, to one side of the “runway”. The runway consisted of a very long stone-defined landing strip on the hard surface of the mudflat. To our amazement there seems to be almost no recent disturbance, a faint trace of the odd 4x4 wheel track, so prevalent elsewhere, but no sign of a bulldozer, thankfully. The 'KENSINGTON' landing ground. © APAAME_20141015_RHB-0441. 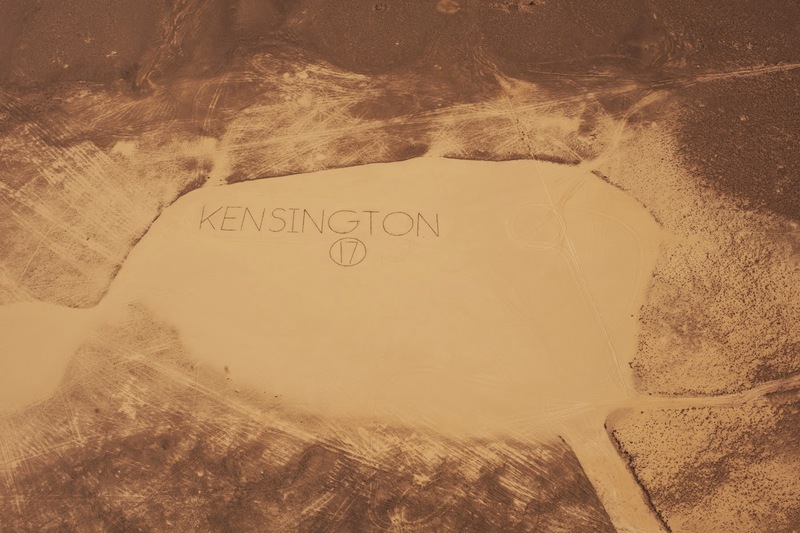 The second site was one of the circular markers for the Cairo to Baghdad Airmail Route (one of the routes is described in R. Hill’s book on the subject from 1929) – number 17, but curiously this site also has inscribed in the sand the name "KENSINGTON". Both the number and the name are clearly visible on Google Earth. 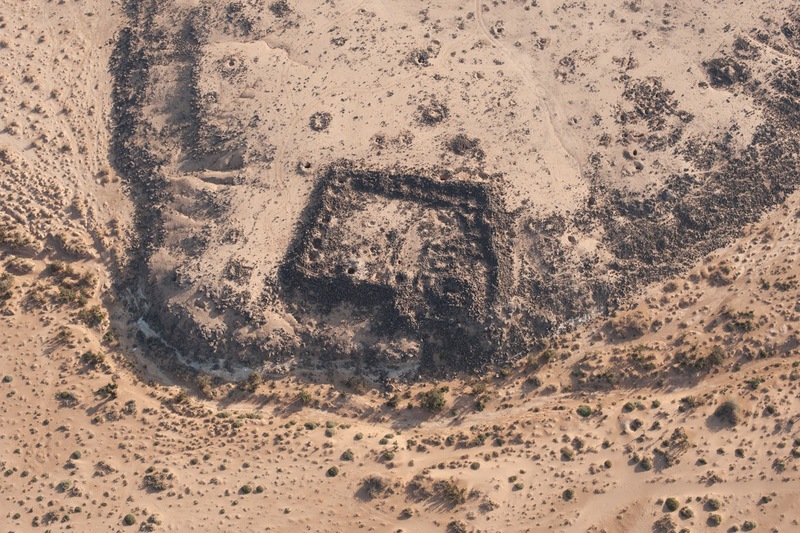 Our flight confirmed there has been little recent disturbance and we could also see what we interpret to be the remains of what must have been a camp, rectilinear stone-built platforms for tents. It is very unlikely any of the pilots from this period (1920s-1940s) are still alive but it would be fascinating to find out if any diaries exist of life at “Kensington”. Remains of a camp near "Kensington". © APAAME_20141015_RHB-0443. So, why the longest day? We left the Institute in Amman at 0630, and started flying at about 0715 and didn’t get back to Marka, after a long transit flight from Ruweishid, until almost 5 pm. Normally we do 4 to 6 hours flying (2 or 3 sorties) but today it was 4 separate flights, 3 re-fuellings for the aircraft but very little “fuel” for the pilots or ourselves and a total of 7.5 hours flying.